Having loved the Fraser brothers, I just HAD to have the book when I saw that B.J.Scott had blessed us with another. 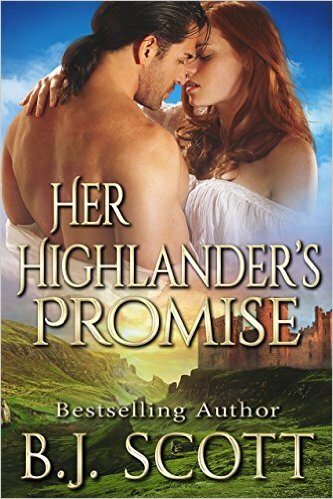 Her Highlander’s Promise is such a sweet tale of love conquers all with just enough excitement, violence, passion and action to maintain another fabulous and loved book. Now I’ll be honest here, I purchased the book simply because of the author, I didn’t think to like it from the description considering the idea too simple and to ‘tame’. I hold my hands up and admit I was wrong. The story starts with a ten year old Laurel burying her father and facing the prospect of life with her controlling aunt, uncle and cousin. A handsome 13 year old that she has not met before gives her a ring and promises to return to wed her. It continues when Laurel is close to her 18th birthday. We find how she has suffered at the hands of a viscious, highly controlling aunt and a completely uninterested uncle who merely allows his wife to do as she pleases. Gaining a small amount of freedom, laurel is permitted a quick trip to the village to purchase provisions. There she is startled by a handsome man, it seems that Blair has returned for her! I don’t want to describe to much as I want you to have the pleasure of the tale unfolding as you read but it’s enough to assure you that their love is not easy and obstacles must be faced and defeated to allow the young couple to come together. With well developed characters and introductions of many secondary characters that you will just love, B.J.Scott again captivates us. I thoroughly enjoyed this and highly recommend this author!